From humbled Americans ambitions to new policy tactics in Russia; noted expert Fyodor Lukyanov discusses the outcome of the war that dislodged Saddam Hussein. Ten years ago, without the backing of the UN Security Council, the United States began a large-scale military operation in Iraq. The invasion, which was undertaken to demonstrate America's ability to control global processes and (if necessary) redirect them, had the opposite effect. Thousands of Americans perished not during the lightning strike itself, but in the subsequent years of "nation building." As for the number of Iraqis killed, no one knows; the smallest estimate runs into the tens of thousands. In addition, the overthrow of Saddam Hussein played into the hands of Iran — the sworn enemy of the United States. The hundreds of billions of dollars spent on the campaign added to America’s not insignificant economic problems. Even the country’s credibility was undermined — regardless of whether the top brass consciously lied about Hussein's alleged stockpile of nuclear weapons or just believed the reports because they wanted to. In terms of non-proliferation of weapons of mass destruction, the result was also the reverse of what was intended: leaders nurturing thoughts of developing a "bomb" were hurried into action, certain in the knowledge that it was the only safeguard against ending their days on the end of a rope. The democratization of the Middle East — initially forced upon Iraq but later springing up spontaneously during the "Arab spring" — is disheartening. Tuned into the mood of the general populous, the new regimes are vociferously anti-Western. All this is generally acknowledged and barely challenged, even by those who 10 years ago welcomed deliverance from the "most brutal dictator in the world." But let's take a look at the other side of the war: what has the world gained from it? First of all, it dealt a blow to U.S. haughtiness: on the eve of the Iraq War, in the wake of 9/11, the country harbored serious pretensions about becoming a global empire. 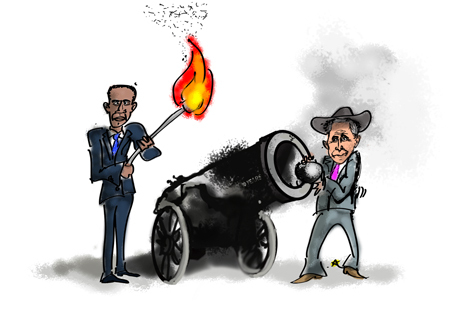 Obama's relative and unusual restraint (for a U.S. president) is the fruit of the Iraqi misadventure. The Iraq War restored the rightful role of the UN Security Council in international politics. When the U.S. decided that it did not require the sanction of a higher authority, it seemed that the UN's political function had ceased to exist: henceforth, strong and confident nations would simply ignore it. However, it soon became clear that the lack of legitimacy, which only the Security Council could have granted, was an insurmountable factor. Then U.S. Secretary of Defense Donald Rumsfeld believed his "coalition of volunteers" could adequately fill the role of NATO, but the legal vacuum paralyzed its ability to act. Regimes can be toppled, but without the formal authorization of an official body, nothing sustainable will take their place. Even under the Bush administration, Washington was forced to reconsider its attitude toward the U.N. as a meaningless burden. Today, the Security Council and other UN institutions are imperfect and subject to justified criticism from various quarters, but a practical, viable alternative has yet to be suggested. In the past 10 years, we have observed on more than one occasion the power of the U.N. in helping to break a deadlock. The Iraq War threw the political differences between the two shores of the Atlantic into sharp relief. Europe's heavyweights sat the contest out. A decade later, no one would say that the trans-Atlantic alliance suffered fatal damage — bygones remain bygones (recall that the U.S. even called for a boycott of all things French). However, it is clear that NATO will no longer police the world as it once did, since most member countries are only capable of purely symbolic participation, if that. As the search for a new mission for the alliance continues, NATO seems to favor the option of becoming a regional military organization charged with resolving issues in its immediate geographical vicinity — i.e., Europe and the Atlantic. For Russia, this is not good news. The "immediate vicinity" is presently the South, but attention could turn eastward. Fortunately, Europe's military capabilities are on the wane, while the U.S. is increasingly looking further afield to Asia. In the Kremlin's eyes, the Iraq War is a milestone for two reasons. First, it significantly weakened the belief that Western policy is far-sighted, prudent, and rational. From the very beginning, Moscow warned that it would end in failure, but the White House turned a deaf ear. Second, Russia is committed to augmenting its capabilities, in case of further developments. The strong do as they please — including trampling all over international law. As a result, Russia now proceeds from the assumption that anything is possible; this means that Russia should be both careful and combat-ready. This is a tactic, not a strategy. Even so, it could serve some purpose in the future. The opinion is abridged and first published in Rossiyskaya Gazeta.